During F&W Cookie Week, some of our favorite digital contributors are sharing their best holiday cookie recipes in a virtual swap. Post your favorite baking experiments on Instagram using #FWCookie. Here, Australian photographer and stylist Chantelle Grady offers one of her favorite holiday recipes, featuring macadamia nuts. "Macadamias are native to Australia and I love using them in sweets," she says. Grady recommends baking this recipe while prepping decorations. "The smell of them baking in the oven while putting up the tree really makes it feel like Christmas." Preheat oven to 175˚C (345˚F). Line 2 baking trays with non-stick baking paper. In a bowl, place the butter and beat until light and fluffy. Add the sugars, salt and vanilla essence and beat to combine. Add the egg and stir to combine. 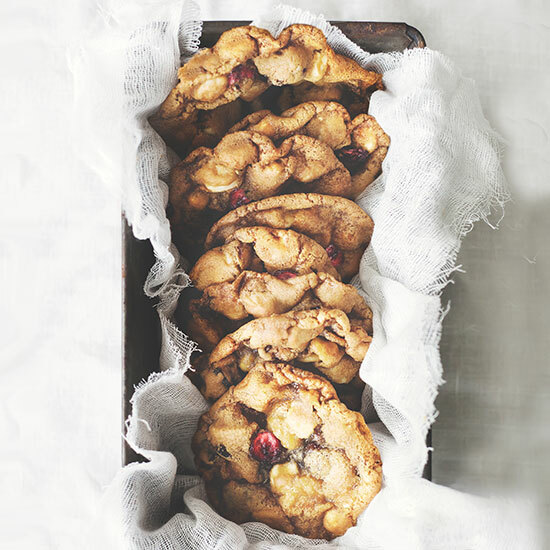 Add the flour, bicarbonate soda, dried cranberries, macadamias and white chocolate chips and stir to combine. Roll large spoonfuls of dough in your hands to form a ball and place on baking trays allowing space between each to spread. Continue until all dough has been used. Gently press each ball with fingers to flatten slightly. Bake in oven for 10 - 15 minutes, or until golden.